For the last two years, we have visited several college campuses looking for the right fit for our daughter as she moves into the next stage of her life. We toured large universities and smaller colleges. Some of them in or near major cities and others out in the sticks. We’ve spoken to guidance counselors, admissions counselors, and yes, even my own counselor (a.k.a. my therapist). Just like any other phase of parenthood, you will receive a lot of advice about this journey. While advice was always appreciated, there will be times when we just wanted to figure it out on our own. And I think that is the best tip I can give to those just starting on this adventure—listen to what others tell you but follow your child’s lead. Although you didn’t realize it, over the last 18 years you have raised them for this moment. Know that you brought them up right with a good head on their shoulders and a set of values that you have given them. Trust that your child knows what they want and what they don’t want. Let them lead. My favorite part of this whole process has been visiting campuses and discussing them on the car ride home. I loved listening to her weigh the pros and cons of each place, considering the location, the community, the academic and social life and the overall “feel” each place offers. And all this time, I’ve admired the maturity she has shown in her decision-making. All along, the only piece of advice I bestowed upon her was what I have told her all her life—go with your gut. I find this is a wonderful mantra for any decision one makes in life. Her gut will tell her what is right and what is wrong for her. If she isn’t happy and confident in her choices, then problems will surely follow. 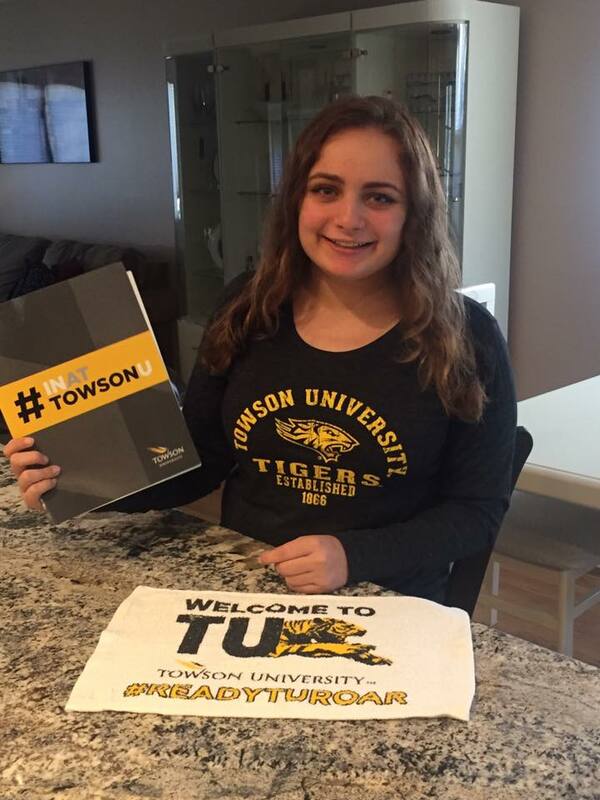 The moment she stepped on Towson’s campus; she knew it was the right place for her. She made a point of meeting the local admissions representative every time she came to our area to learn as much as possible about the community. When the admissions staff called her up to the stage this past fall to tell her in person that she was accepted, the open house became a welcome home. 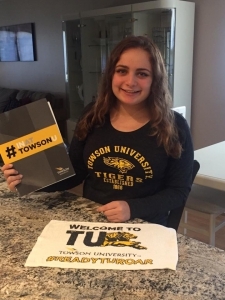 And when she told us that when she thinks of herself at college, she saw herself at Towson, we knew it was the right place for her. So, my unsolicited, but well-meaning, advice to you as you go through this amazing time in your lives as parents is to let your child take the lead. Whether they want to live in a big city or out in the sticks, small college, large university, community college, military, trade school, or whatever, let them go with their gut and they will wind up exactly where they were always supposed to be.